The SI system after the 2019 redefinition: Dependence of base unit definitions on physical constants with fixed numerical values and on other base units. The SI system after 1983, but before the 2019 redefinition: Dependence of base unit definitions on other base units (for example, the metre is defined as the distance travelled by light in a specific fraction of a second), with the constants of nature and artefacts used to define them (such as the mass of the IPK for the kilogram). The previous major change of the metric system was in 1960 when the International System of Units (SI) was formally published. At this time the metre was redefined, from being defined in terms of the prototype metre, to being defined in terms of the wavelength of a spectral line of a krypton-86 radiation,[Note 1] making it derivable from universal natural phenomena. The kilogram remained defined in terms of a physical prototype, leaving it the only artefact upon which the SI unit definitions depend. At this time the SI, as a coherent system, was constructed around seven base units, powers of which were used to construct all other units. With the 2019 redefinition, the SI is instead constructed around seven defining constants, allowing all units to be constructed directly from these constants, with the designation of base units being retained although no longer essential. The metric system was originally conceived as a system of measurement that was derivable from unchanging phenomena, but practical limitations necessitated the use of artefacts (the prototype metre and prototype kilogram) when the metric system was first introduced in France in 1799. Although designed for long-term stability, the masses of the kilogram prototype and its secondary copies have shown small variations over time relative to each other, and they are not thought to be adequate for the increasing accuracy demanded by science, prompting a search for a suitable replacement. Also, some units were defined based on measurements that are difficult to precisely realise in a laboratory, such as the definition of the kelvin in terms of the triple point of water. With the 2019 redefinition, the SI is for the first time wholly derivable from natural phenomena, with most units based on fundamental physical constants. A number of authors[who?] have published criticisms of the revised definitions – including that the proposal had failed to address the impact of breaking the link between the definition of the dalton[Note 2] and the definitions of the kilogram, the mole, and the Avogadro constant. The basic structure of SI was developed over a period of about 170 years (1791 to 1960). Since 1960, technological advances have made it possible to address various weaknesses in SI, such as the dependence on an artefact to define the kilogram. During the early years of the French Revolution, the leaders of the French National Constituent Assembly decided to introduce a completely new system of measurement based on the principles of logic and natural phenomena. Specifically, the metre was defined as one ten-millionth of the distance from the North Pole to the Equator, and the kilogram as the mass of one thousandth of a cubic metre of pure water. Although these definitions were chosen so that nobody would "own" the units, they could not be measured with sufficient convenience or precision for practical use. Instead, realisations were created in the form of the mètre des Archives and kilogramme des Archives which were a "best attempt" at fulfilling these principles. CGPM (General Conference on Weights and Measures, Conférence générale des poids et mesures) – The Conference meets every four to six years and consists of delegates of the nations who had signed the convention. It discusses and examines the arrangements required to ensure the propagation and improvement of the International System of Units and it endorses the results of new fundamental metrological determinations. CIPM (International Committee for Weights and Measures, Comité international des poids et mesures) – The Committee consists of eighteen eminent scientists, each from a different country, nominated by the CGPM. The CIPM meets annually and is tasked to advise the CGPM. The CIPM has set up a number of sub-committees, each charged with a particular area of interest. One of these, the Consultative Committee for Units (CCU), amongst other things, advises the CIPM on matters concerning units of measurement. 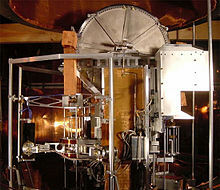 BIPM (International Bureau for Weights and Measures, Bureau international des poids et mesures) – The Bureau provides safe keeping of the international prototype kilogram and metre, provides laboratory facilities for regular comparisons of the national prototypes with the international prototype and is the secretariat for the CIPM and the CGPM. The first CGPM (1889) formally approved the use of 40 prototype metres and 40 prototype kilograms from the British firm Johnson Matthey as the standards mandated by the Convention of the Metre. One of each of these was nominated by lot as the international prototypes, other copies were retained by the CGPM as working copies, and the rest were distributed to member nations for use as their national prototypes. At regular intervals the national prototypes were compared with and recalibrated against the international prototype. In 1921 the Convention of the Metre was revised and the mandate of the CGPM was extended to provide standards for all units of measure, not just mass and length. In the ensuing years, the CGPM took on responsibility for providing standards of electric current (1946), luminosity (1946), temperature (1948), time (1956), and molar mass (1971). The 9th CGPM (1948) instructed the CIPM "to make recommendations for a single practical system of units of measurement, suitable for adoption by all countries adhering to the Metre Convention". The recommendations based on this mandate were presented to the 11th CGPM (1960) where they were formally accepted and given the name "Système International d'Unités" and its abbreviation "SI". Changing the underlying principles behind the definition of the SI base units is not without precedent. The 11th CGPM (1960) defined the SI metre in terms of the wavelength of krypton-86 radiation, replacing the pre-SI metre bar. The 13th CGPM (1967) replaced the original definition of the second (which was based on Earth's average rotation during 1750–1892) with a definition based on the frequency of the radiation emitted between two hyperfine levels of the ground state of the caesium-133 atom. And the 17th CGPM (1983) replaced the 1960 definition of the metre with one based on the second, by giving an exact definition of the speed of light in units of metres per second. Mass drift over time of national prototypes K21–K40, plus two of the International Prototype Kilogram's (IPK's) sister copies: K32 and K8(41). [Note 3] All mass changes are relative to the IPK. Over the years, drifts of up to 6992200000000000000♠2×10−8 kilograms per annum in the national prototype kilograms relative to the international prototype kilogram have been detected. There was no way of determining whether the national prototypes were gaining mass or whether the IPK was losing mass. Newcastle University metrologist Peter Cumpson has since identified mercury vapour absorption or carbonaceous contamination as possible causes of this drift. At the 21st meeting of the CGPM (1999), national laboratories were urged to investigate ways of breaking the link between the kilogram and a specific artefact. Independently of this drift having been identified, the Avogadro project and development of the Kibble balance (known as a "watt balance" before 2016) promised methods of indirectly measuring mass with a very high precision. These projects provided tools that would enable alternative means of redefining the kilogram. A report published in 2007 by the Consultative Committee for Thermometry (CCT) to the CIPM noted that their current definition of temperature has proved to be unsatisfactory for temperatures below 20 K (−253 °C; −424 °F) and for temperatures above 1,300 K (1,030 °C; 1,880 °F). The committee was of the view that the Boltzmann constant provided a better basis for temperature measurement than did the triple point of water, as it overcame these difficulties. At its 23rd meeting (2007), the CGPM mandated the CIPM to investigate the use of natural constants as the basis for all units of measure rather than the artefacts that were then in use. The following year this was endorsed by the International Union of Pure and Applied Physics (IUPAP). At a meeting of the CCU held in Reading, United Kingdom, in September 2010, a resolution and draft changes to the SI brochure that were to be presented to the next meeting of the CIPM in October 2010 were agreed to in principle. The CIPM meeting of October 2010 found that "the conditions set by the General Conference at its 23rd meeting have not yet been fully met. [Note 4] For this reason the CIPM does not propose a revision of the SI at the present time"; however, the CIPM presented a resolution for consideration at the 24th CGPM (17–21 October 2011) to agree to the new definitions in principle, but not to implement them until the details have been finalised. This resolution was accepted by the conference, and in addition the CGPM moved the date of the 25th meeting forward from 2015 to 2014. At the 25th meeting (18–20 November 2014), it was found that "despite [the progress in the necessary requirements] the data do not yet appear to be sufficiently robust for the CGPM to adopt the revised SI at its 25th meeting", thus postponing the revision to the next meeting in 2018. Measurements accurate enough to meet the conditions were available in 2017, and the redefinition was adopted at the 26th CGPM (13–16 November 2018). The numerical values adopted by the CGPM are identical to the published CODATA 2017 values. The Planck constant h is exactly 6966662607015000000♠6.62607015×10−34 joule-second (J⋅s). The elementary charge e is exactly 6981160217663400000♠1.602176634×10−19 coulomb (C). The Boltzmann constant k is exactly 6977138064900000000♠1.380649×10−23 joule per kelvin (J⋅K−1). The Avogadro constant NA is exactly 7023602214076000000♠6.02214076×1023 reciprocal mole (mol−1). These constants were described in the 2006 version of the SI manual, but in that version the latter three were defined as "constants to be obtained by experiment" rather than as "defining constants". The speed of light c is exactly 7008299792458000000♠299792458 metres per second (m⋅s−1). The ground state hyperfine structure transition frequency of the caesium-133 atom ΔνCs is exactly 7009919263177000000♠9192631770 hertz (Hz). The luminous efficacy Kcd of monochromatic radiation of frequency 7014540000000000000♠540×1012 Hz is exactly 7002683000000000000♠683 lumens per watt (lm⋅W−1). The seven definitions above are rewritten below with the derived units (joule, coulomb, hertz, lumen, and watt) expressed in terms of the seven base units (second, metre, kilogram, ampere, kelvin, mole, and candela), according to the draft ninth SI Brochure. In the list that follows, the symbol sr stands for the dimensionless unit steradian. As part of the redefinition, the international prototype kilogram was retired and definitions of the kilogram, the ampere, and the kelvin were replaced. The definition of the mole was revised. These changes have the effect of redefining the SI base units, though the definitions of the SI derived units in terms of the base units remain the same. Following the CCU proposal, the text of the definitions of all the base units was either refined or rewritten changing the emphasis from explicit-unit to explicit-constant type definitions. Explicit-unit type definitions define a unit in terms of a specific example of that unit – for example in 1324 Edward II defined the inch as being the length of three barleycorns and since 1889 the kilogram has been defined as being the mass of the International Prototype Kilogram. In explicit-constant definitions, a constant of nature is given a specified value and the definition of the unit emerges as a consequence. For example, in 1983, the speed of light was defined to be exactly 7008299792458000000♠299792458 metres per second and, since the second had been independently defined, the length of the metre could thus be derived. The previous (as of 2018[update]) and 2019 definitions are given below. The new definition of the second is effectively the same as the previous one, the only difference being that the conditions under which the definition applies are more rigorously defined. Previous definition: The second is the duration of 7009919263177000000♠9192631770 periods of the radiation corresponding to the transition between the two hyperfine levels of the ground state of the caesium-133 atom. 2019 definition: The second, symbol s, is the SI unit of time. It is defined by taking the fixed numerical value of the caesium frequency ΔνCs, the unperturbed ground-state hyperfine transition frequency of the caesium-133 atom, to be 7009919263177000000♠9192631770 when expressed in the unit Hz, which is equal to s−1. The new definition of the metre is effectively the same as the previous one, the only difference being that the additional rigour in the definition of the second will propagate to the metre. Previous definition: The metre is the length of the path travelled by light in vacuum during a time interval of 1/7008299792458000000♠299792458 of a second. 2019 definition: The metre, symbol m, is the SI unit of length. It is defined by taking the fixed numerical value of the speed of light in vacuum c to be 7008299792458000000♠299792458 when expressed in the unit m⋅s−1, where the second is defined in terms of the caesium frequency ΔνCs. A Kibble balance, which is being used to measure the Planck constant in terms of the international prototype kilogram. The definition of the kilogram changed fundamentally – the previous definition defined the kilogram as being the mass of the international prototype kilogram, which is an artefact and not a constant of nature, whereas the new definition relates it to the equivalent mass of the energy of a photon given its frequency, via the Planck constant. Previous definition: The kilogram is the unit of mass; it is equal to the mass of the international prototype of the kilogram. 2019 definition: The kilogram, symbol kg, is the SI unit of mass. It is defined by taking the fixed numerical value of the Planck constant h to be 6966662607015000000♠6.62607015×10−34 when expressed in the unit J⋅s, which is equal to kg⋅m2⋅s−1, where the metre and the second are defined in terms of c and ΔνCs. A consequence of this change is that the new definition of the kilogram is dependent on the definitions of the second and the metre. The definition of the ampere underwent a major revision – the previous definition, which is difficult to realise with high precision in practice, was replaced by a definition that is more intuitive and easier to realise. Previous definition: The ampere is that constant current which, if maintained in two straight parallel conductors of infinite length, of negligible circular cross-section, and placed 1 m apart in vacuum, would produce between these conductors a force equal to 6993200000000000000♠2×10−7 newton per metre of length. 2019 definition: The ampere, symbol A, is the SI unit of electric current. It is defined by taking the fixed numerical value of the elementary charge e to be 6981160217663400000♠1.602176634×10−19 when expressed in the unit C, which is equal to A⋅s, where the second is defined in terms of ΔνCs. that the impedance of free space (Z0) likewise had a fixed value. A consequence of the revised definition is that the ampere no longer depends on the definitions of the kilogram and the metre, but does still depend on the definition of the second. In addition, the numerical values of the vacuum permeability, vacuum permittivity, and impedance of free space, which were exact before the redefinition, will be subject to experimental error after the redefinition. The definition of the kelvin underwent a fundamental change. Rather than using the triple point of water to fix the temperature scale, the new definition uses the energy equivalent as given by Boltzmann's equation. Previous definition: The kelvin, unit of thermodynamic temperature, is 1/273.16 of the thermodynamic temperature of the triple point of water. 2019 definition: The kelvin, symbol K, is the SI unit of thermodynamic temperature. It is defined by taking the fixed numerical value of the Boltzmann constant k to be 6977138064900000000♠1.380649×10−23 when expressed in the unit J⋅K−1, which is equal to kg⋅m2⋅s−2⋅K−1, where the kilogram, metre and second are defined in terms of h, c and ΔνCs. 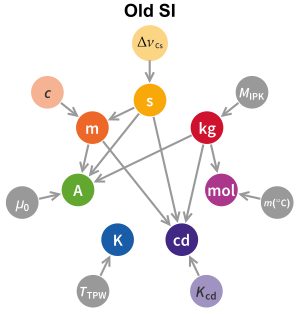 One consequence of this change is that the new definition makes the definition of the kelvin depend on the definitions of the second, the metre, and the kilogram. The previous definition of the mole linked it to the kilogram. The revised definition breaks that link by making a mole a specific number of entities of the substance in question. Previous definition: The mole is the amount of substance of a system that contains as many elementary entities as there are atoms in 0.012 kilogram of carbon-12. When the mole is used, the elementary entities must be specified and may be atoms, molecules, ions, electrons, other particles, or specified groups of such particles. 2019 definition::22 The mole, symbol mol, is the SI unit of amount of substance. One mole contains exactly 7023602214076000000♠6.02214076×1023 elementary entities. This number is the fixed numerical value of the Avogadro constant, NA, when expressed in the unit mol−1 and is called the Avogadro number. The amount of substance, symbol n, of a system is a measure of the number of specified elementary entities. An elementary entity may be an atom, a molecule, an ion, an electron, any other particle or specified group of particles. The wording of the ninth SI Brochure[Note 5] implies that the first statement remains valid, which means that the second is no longer true. The molar mass constant, while still with great accuracy remaining 6997100000000000000♠1 g/mol, is no longer exactly equal to that. Draft Resolution A, which was voted on at the 26th CGPM, only stated that "the molar mass of carbon 12, M(12C), is equal to 6998120000000000000♠0.012 kg⋅mol−1 within a relative standard uncertainty equal to that of the recommended value of NAh at the time this Resolution was adopted, namely 6990450000000000000♠4.5×10−10, and that in the future its value will be determined experimentally", which makes no reference to the dalton and is consistent with either statement. The new definition of the candela is effectively the same as the current definition, with the only difference being that the additional rigour in the definition of the second and metre will propagate to the candela. Previous definition: The candela is the luminous intensity, in a given direction, of a source that emits monochromatic radiation of frequency 7014540000000000000♠540×1012 Hz and that has a radiant intensity in that direction of 1/683 watt per steradian. 2019 definition: The candela, symbol cd, is the SI unit of luminous intensity in a given direction. It is defined by taking the fixed numerical value of the luminous efficacy of monochromatic radiation of frequency 7014540000000000000♠540×1012 Hz, Kcd, to be 683 when expressed in the unit lm⋅W−1, which is equal to cd⋅sr⋅W−1, or cd⋅sr⋅kg−1⋅m−2⋅s3, where the kilogram, metre and second are defined in terms of h, c and ΔνCs. All seven of the base units will be defined in terms of defined constants[Note 6] and universal physical constants. [Note 7] Seven constants are needed to define the seven base units, but there is not a direct correspondence between each specific base unit and a specific constant: aside from the second and the mole, more than one of the seven constants contributes to the definition of any given base unit. When the New SI was first designed, there were more than six suitable physical constants from which the designers could choose. For example, once length and time had been established, the universal gravitational constant G could, from a dimensional point of view, be used to define mass. [Note 8] It should be noted that in practice G can be measured only with a relative uncertainty of the order of 10−5,[Note 9] which would have resulted in upper limit of the kilogram's reproducibility being around 10−5 whereas the current international prototype kilogram can be measured with a reproducibility of 1.2 × 10−8. The choice of physical constants was made on the basis of minimal uncertainty associated with measuring the constant and the degree of independence of the constant in respect of other constants that were being used. Although the BIPM has developed a standard mise en pratique (practical technique) for each type of measurement, the mise en pratique used to make the measurement is not part of the measurement's definition – it is merely an assurance that the measurement can be done without exceeding the specified maximum uncertainty. Fundamental physical constants are often algebraically related through theory. This implies that the most precise estimate of a fundamental physical constant often can be determined by directly measuring other fundamental physical constants, from which the value can be calculated. The uncertainty in these constants is then determined from the uncertainty of the others by the propagation of uncertainty. Constants whose value is fixed, for determining the units in which they are expressed, do not have an uncertainty associated with them, so they do not contribute any extra uncertainty to the value calculated for the constant. One of the reasons that the SI unit system will be changed is that determination of values can often be greatly improved if expressed in terms of the revised unit definitions. This is due to the dependence of their values on physical constants. The following table catalogues the notable changes in determination of fundamental physical constants. The constants are expressed in direct measurements and fixed constants to minimise and determine the uncertainty. Some constants in that expression do not contribute significantly to the final uncertainty; only the significant factors are noted. The value of the relative uncertainty using the data of CODATA of 2014 is given, and is expressed in the relative uncertainty of the significant factors, noted with ur(constant). An approximately equals sign (≈) is used if an uncertainty is only approximated by the expression due to insignificant factors or linear approximation. For the redefinition of the kilogram, at least three separate experiments be carried out yielding values for the Planck constant having a relative expanded (95%) uncertainty of no more than 6992500000000000000♠5×10−8 and at least one of these values should be better than 6992200000000000000♠2×10−8. Both the Kibble balance and the Avogadro project should be included in the experiments and any differences between these be reconciled. For the redefinition of the kelvin, the relative uncertainty of Boltzmann constant derived from two fundamentally different methods such as acoustic gas thermometry and dielectric constant gas thermometry be better than 10−6 and that these values be corroborated by other measurements. As at March 2011, the International Avogadro Coordination (IAC) group had obtained an uncertainty of 6992300000000000000♠3.0×10−8 and NIST had obtained an uncertainty of 6992360000000000000♠3.6×10−8 in their measurements. On 1 September 2012 the European Association of National Metrology Institutes (EURAMET) launched a formal project to reduce the relative difference between the Kibble balance and the silicon sphere approach to measuring the kilogram from 6993170000000000000♠(17±5)×10−8 to within 6992200000000000000♠2×10−8. As of March 2013[update] the proposed redefinition is known as the "New SI", but Mohr, in a paper following the CGPM proposal but predating the formal CCU proposal, suggested that since the proposed system makes use of atomic scale phenomena rather than macroscopic phenomena, it should be called the "Quantum SI System". As of the 2014 CODATA recommended values of the fundamental physical constants (published in 2016, using data collected through the end of 2014), all measurements meet the CGPM's requirements and the way is clear to proceed with the redefinition and the next CGPM quadrennial meeting in late 2018. On 20 October 2017, the 106th meeting of the International Committee for Weights and Measures (CIPM) formally accepted a revised Draft Resolution A calling for the redefinition of the SI, to be voted on at the 26th CGPM,:17–23 The same day, in response to the CIPM's endorsement of the final values,:22 the CODATA Task Group on Fundamental Constants published its 2017 recommended values for the four constants (with uncertainties) and proposed numerical values for the redefinition (without uncertainty). The vote, held on 16 November 2018 at the 26th GCPM, was unanimous from all attending national representatives in favour of the revised proposal. The new definitions will become effective on 20 May 2019. In 2010, Marcus Foster of the Commonwealth Scientific and Industrial Research Organisation published a wide-ranging critique of SI in which he raised numerous issues ranging from basic issues such as the absence of the symbol "Ω" from most Western keyboards to the abstract issues such as inadequate formalism in the metrological concepts on which SI is based. The changes proposed in the New SI only addressed issues regarding the definition of the base units including new definitions of the candela and the mole – units that Foster argued were not true base units. Other issues raised by Foster fell outside the scope of the proposal. Concerns have been expressed that the use of explicit-constant definitions of the unit being defined that are not related to an example of its quantity will have many adverse effects. Although this criticism applies to the proposed linking of the kilogram to the Planck constant h via a route that requires a knowledge of both special relativity and quantum mechanics, it does not apply to the proposed definition of the ampere, which is closer to an example of its quantity than is the current definition. Some observers have welcomed the proposal to base the definition of electric current on the charge of the electron rather than the current definition of a force between two parallel current-carrying wires; since the nature of the electromagnetic interaction between two bodies at the quantum electrodynamics level is somewhat different from the nature at classical electrodynamic levels, it is considered inappropriate to use classical electrodynamics to define quantities that exist at quantum electrodynamic levels. When the scale of the divergence between the IPK and national kilogram prototypes was reported in 2005, a debate arose on how best to redefine the kilogram – should the kilogram be defined in terms of the mass of the silicon-28 atom or should it be determined using the Kibble balance? The mass of a silicon atom could be determined using the Avogadro project and using the Avogadro number be linked directly to the kilogram. Concern has also been expressed that the authors of the proposal had failed to address the impact of breaking the link between the mole, kilogram, the dalton (Da), and the Avogadro constant (NA). [Note 12] This direct link has caused many to argue that the mole is not a true physical unit, but, in the words of the Swedish philosopher Johansson, a "scaling factor". The SI Brochure (8th edition) defines the dalton in terms of the mass of an atom of 12C. It defines the Avogadro constant in terms of this mass and the kilogram, making it determined by experiment. The proposal fixes the Avogadro constant, and the draft of the Ninth SI Brochure retains the definition of dalton in terms of 12C, with the effect that the link between the dalton and the kilogram will be broken. In 1993, the International Union of Pure and Applied Chemistry (IUPAC) approved the use of the dalton as an alternative to the unified atomic mass unit with the qualification that the CGPM had not given its approval. This approval has since been given. Following the proposal to redefine the mole by fixing the value of the Avogadro constant, Brian Leonard of the University of Akron, writing in Metrologia proposed that the dalton (Da) be redefined such that NA = (g/Da) mol−1, but that the unified atomic mass unit (mu) retain its current definition based on the mass of 12C, ceasing to exactly equal to the dalton. This would result in the dalton and the atomic mass unit potentially differing from each other with a relative uncertainty of the order of 10−10. However, the draft of the ninth SI Brochure defines both the dalton (Da) and the unified atomic mass unit (u) as exactly 1/12 of the mass of a free carbon-12 atom and not in relation to the kilogram, with the effect that instead the above equation will be inexact. and k is the Boltzmann constant. However, Chyla acknowledged that in the macroscopic world temperature plays the role of a base unit as much of the theory of thermodynamics is based on temperature. The Consultative Committee for Thermometry, part of the International Committee for Weights and Measures publishes a mise en pratique (practical technique), last updated in 1990, for measuring temperature which, at very low and at very high temperatures, makes great use of linking energy to temperature via the Boltzmann constant. Foster argued that "luminous intensity [the candela] is not a physical quantity, but a photobiological quantity that exists in human perception", thereby questioning whether the candela should be a base unit. ^ The metre was redefined again in 1983 by fixing the value of the speed of light. That definition will remain in effect after 2019. ^ The dalton is not defined in the formal proposal to be voted upon by the CGPM, only in the (draft) Ninth SI Brochure. ^ Prototype No. 8(41) was accidentally stamped with the number 41, but its accessories carry the proper number 8. Since there is no prototype marked 8, this prototype is referred to as 8(41). ^ A footnote in Table 8 on non-SI units states: "The dalton (Da) and the unified atomic mass unit (u) are alternative names (and symbols) for the same unit, equal to 1/12 of the mass of a free carbon 12 atom, at rest and in its ground state." ^ Though the three quantities temperature, luminous intensity and amount of substance may be regarded from a fundamental physical perspective as derived quantities, these are perceptually independent quantities and have conversion constants defined that relate the historically defined units to the underlying physics. ^ The definition of the candela is atypical within the base units: translating physical measurements of spectral intensity into units of candela also requires a model of the response of the human eye to different wavelengths of light known as the luminosity function and denoted by V(λ), a function that is determined by the International Commission on Illumination (CIE). ^ The dimensions of G are L3M−1T−2, so once standards have been established for length and for time, mass can in theory be deduced from G. Also, when fundamental constants as relations between these three units are set, the units can be deduced by a combination of these constants, for example as a linear combination of Planck units. ^ Technically, the mass of the International Prototype Kilogram is no longer a "physical constant", as the artefact is abandoned as a reference in the new SI. ^ Although the calculation of the uncertainty implies that the fine structure constant isn't a significant factor, because of rounding errors, the uncertainty in fine structure constant does have an effect on the determined value. ^ The two quantities of the Avogadro constant NA and the Avogadro number NN are numerically the same, but while NA has the unit mol−1, NN is a pure number. ^ "Decision CIPM/105-13 (October 2016)". The day is the 144th anniversary of the Metre Convention. ^ a b Kühne, Michael (22 March 2012). "Redefinition of the SI". Keynote address, ITS9 (Ninth International Temperature Symposium). Los Angeles: NIST. Archived from the original on 2013-06-18. Retrieved 2012-03-01. ^ a b c d e f "Draft of the ninth SI Brochure" (PDF). BIPM. 28 December 2018. Retrieved 2019-03-20. ^ "Historic Vote Ties Kilogram and Other Units to Natural Constants". NIST. 16 November 2018. Retrieved 2018-11-16. ^ Milton, Martin (14 November 2016). Highlights in the work of the BIPM in 2016 (PDF). SIM XXII General Assembly. Montevideo, Uruguay. p. 10. The conference ran from 13–16 November and the vote on the redefinition was scheduled for the last day. ^ a b c d e Proceedings of the 106th meeting (PDF). International Committee for Weights and Measures. Sèvres. 16–20 October 2017. ^ Crease, Robert P. (2011). "France: "Realities of Life and Labor"". World in the Balance. New York: W. W. Norton & Company, Inc. pp. 83–84. ISBN 978-0-393-07298-3. ^ Alder, Ken (2002). The Measure of all Things – The Seven-Year-Odyssey that Transformed the World. London: Abacus. p. 1. ISBN 978-0-349-11507-8. ^ "Metric Convention of 1875 [English translation]". Washington, D.C.: Office of the President of the United States. 1876. Archived from the original on 2005-03-01. ^ "The Metre Convention". Sèvres, France: International Bureau of Weights and Measures. Retrieved 2013-06-21. ^ "CIPM: International Committee for Weights and Measures". Sèvres, France: BIPM. Retrieved 2010-10-03. ^ "Resolution of the 1st meeting of the CGPM (1889)". Sèvres, France: International Bureau of Weights and Measures. Retrieved 2013-06-21. ^ Jabbour, Z.J. ; Yaniv, S.L. (2001). "The Kilogram and Measurements of Mass and Force" (PDF). Journal of Research of the National Institute of Standards and Technology. 106 (1): 25–46. doi:10.6028/jres.106.003. PMC 4865288. PMID 27500016. Archived from the original (PDF) on 2011-06-04. Retrieved 2011-03-28. ^ "Resolution 6 of the 9th meeting of the CGPM (1948): Proposal for establishing a practical system of units of measurement". Retrieved 2011-03-23. ^ "Resolution 12 of the 11th meeting of the CGPM (1960): Système International d'Unités". Sèvres, France. Retrieved 2011-03-23. ^ Girard, G. (1994). "The Third Periodic Verification of National Prototypes of the Kilogram (1988–1992)". Metrologia. 31 (4): 317–336. Bibcode:1994Metro..31..317G. doi:10.1088/0026-1394/31/4/007. ^ Mohr, Peter (6 December 2010). "Recent progress in fundamental constants and the International System of Units" (PDF). Third Workshop on Precision Physics and Fundamental Physical Constants. Retrieved 2011-01-02. ^ Whipple, Tom (7 January 2013). "The dirty secret of why you are not quite as heavy as you think". The Times. London. p. 15. Retrieved 2011-03-23. ^ Ghose, Tia (6 January 2013). "The Kilogram Has Gained Weight". LiveScience. Retrieved 2011-03-23. ^ a b Crease, Robert P. (22 March 2011). "Metrology in the balance". Physics World. Institute of Physics. Retrieved 2012-06-28. ^ Fischer, J.; et al. (2 May 2007). "Report to the CIPM on the implications of changing the definition of the base unit kelvin" (PDF). Retrieved 2011-01-02. ^ "Resolution proposal submitted to the IUPAP Assembly by Commission C2 (SUNAMCO)" (PDF). International Union of Pure and Applied Physics. 2008. Retrieved 2015-09-06. ^ Mills, Ian (29 September 2010). "On the possible future revision of the International System of Units, the SI" (PDF). CCU. Retrieved 2011-01-01. ^ Mills, Ian (29 September 2010). "Draft Chapter 2 for SI Brochure, following redefinitions of the base units" (PDF). CCU. Retrieved 2011-01-01. ^ "Resolution 12 of the 23rd meeting of the CGPM (2007)". Sèvres, France: General Conference on Weights and Measures. Retrieved 2013-06-21. ^ "Towards the "new SI"". International Bureau of Weights and Measures (BIPM). Retrieved 2011-02-20. ^ "On the possible future revision of the International System of Units, the SI – Draft Resolution A" (PDF). International Committee for Weights and Measures (CIPM). Retrieved 2011-07-14. ^ "Resolution 1: On the possible future revision of the International System of Units, the SI" (PDF). 24th meeting of the General Conference on Weights and Measures. Sèvres, France: International Bureau for Weights and Measures. 21 October 2011. It is not expected to be adopted until some prerequisite conditions are met, and in any case not before 2014. See "Possible changes to the international system of units". IUPAC Wire. 34 (1). January–February 2012. ^ "General Conference on Weights and Measures approves possible changes to the International System of Units, including redefinition of the kilogram" (PDF) (Press release). Sèvres, France: General Conference on Weights and Measures. 23 October 2011. Retrieved 2011-10-25. ^ Mohr, Peter (2 November 2011). "Redefining the SI base units". NIST Newsletter. NIST. Retrieved 2012-03-01. ^ "Resolutions adopted by the CGPM at its 25th meeting (18–20 November 2014)" (PDF). Sèvres, France: International Bureau for Weights and Measures. 21 November 2014. ^ a b c Newell, David B.; Cabiati, F.; Fischer, J.; Fujii, K.; Karshenboim, S. G.; Margolis, H. S.; de Mirandés, E.; Mohr, P. J.; Nez, F.; Pachucki, K.; Quinn, T. J.; Taylor, B. N.; Wang, M.; Wood, B. M.; Zhang, Z.; et al. (Committee on Data for Science and Technology (CODATA) Task Group on Fundamental Constants (TGFC)) (20 October 2017). "The CODATA 2017 Values of h, e, k, and NA for the Revision of the SI". Metrologia. 55 (1): L13. Bibcode:2018Metro..55L..13N. doi:10.1088/1681-7575/aa950a. ^ Mills, Ian (September–October 2011). "Part II – Explicit-Constant Definitions for the Kilogram and for the Mole". Chemistry International. 33 (5): 12–15. ISSN 0193-6484. ^ Travenor, Robert (2007). Smoot's Ear – The Measure of Humanity. Yale University Press. pp. 35–36. ISBN 978-0-300-14334-8. ^ a b "The BIPM watt balance". International Bureau of Weights and Measures. 2012. Retrieved 2013-03-28. ^ Taylor, Barry N (November–December 2011). "The Current SI Seen From the Perspective of the Proposed New SI". Journal of Research of the National Institute of Standards and Technology. 116 (6): 797–80. doi:10.6028/jres.116.022. ^ "Unit of electric current (ampere)". Historical context of the SI. NIST. Retrieved 2015-09-07. ^ Orfanidis, Sophocles J. (31 August 2010). Electromagnetic Waves and Antennas (PDF). ECE Department, Rutgers University. 1.3 Constitutive Relations. Retrieved 2013-06-24. ^ a b c d Chyla, W.T. (December 2011). "Evolution of the International Metric System of Units SI" (PDF). Acta Physica Polonica A. 120 (6): 998–1011. Retrieved 2013-06-22. ^ "Redefining the Mole". NIST. NIST. 23 October 2018. Retrieved 2018-10-24. ^ Wyszecki, G; Blevin, WR; Kessler, KG; Mielenz, KD (1983). Principles covering Photometry (PDF). Sevres: Conférence général des poids et mesures (CGPM). ^ "What is a mise en pratique?". BIPM. 2011. Retrieved 2015-09-06. is a set of instructions that allows the definition to be realised in practice at the highest level. ^ "Recommendations of the Consultative Committee for Mass and Related Quantities to the International Committee for Weights and Measures" (PDF). 12th Meeting of the CCM. Sèvres: Bureau International des Poids et Mesures. 26 March 2010. Retrieved 2012-06-27. ^ "Recommendations of the Consultative Committee for Amount of Substance: Metrology in Chemistry to the International Committee for Weights and Measures" (PDF). 16th Meeting of the CCQM. Sèvres: Bureau International des Poids et Mesures. 15–16 April 2010. Retrieved 2012-06-27. ^ "Recommendations of the Consultative Committee for Thermometry to the International Committee for Weights and Measures" (PDF). 25th Meeting of the Consultative Committee for Thermometry. Sèvres: Bureau International des Poids et Mesures. 6–7 May 2010. Retrieved 2012-06-27. ^ "kilogram NOW – Realization of the awaited definition of the kilogram". European Association of National Metrology Institutes. Retrieved 2012-10-08. ^ Mohr, Peter J. (2008). The Quantum SI: A Possible New International System of Units. Advances in Quantum Chemistry. 53. Academic Press. p. 34. Bibcode:2008AdQC...53...27M. doi:10.1016/s0065-3276(07)53003-0. ISBN 978-0-12-373925-4. Retrieved 2012-04-02. ^ "Universe's Constants Now Known with Sufficient Certainty to Completely Redefine the International System of Units" (Press release). NIST. 22 November 2016. Retrieved 2016-12-31. ^ Mohr, Peter J.; Newell, David B.; Taylor, Barry N. (26 September 2016). "CODATA recommended values of the fundamental physical constants: 2014". Reviews of Modern Physics. 88 (3): 035009–1–73. arXiv:1507.07956. Bibcode:2016RvMP...88c5009M. doi:10.1103/RevModPhys.88.035009. This is a truly major development, because these uncertainties are now sufficiently small that the adoption of the new SI by the 26th CGPM is expected. ^ Conover, Emily (16 November 2018). "It's official: We're redefining the kilogram". Science News. Retrieved 2018-11-16. ^ a b c Foster, Marcus P (5 October 2010). "The next 50 years of the SI: a review of the opportunities for the e-Science age". Metrologia. 47 (6): R41–R51. Bibcode:2010Metro..47R..41F. doi:10.1088/0026-1394/47/6/R01. Retrieved 2013-06-24. ^ Price, Gary (2011). "A sceptic's review of the New SI". Accreditation and Quality Assurance. 16 (3): 121–132. doi:10.1007/s00769-010-0738-x. ^ Censullo, Albert C (September–October 2011). "Part I – From the Current "Kilogram Problem" to a Proposed Definition". Chemistry International. 33 (5): 9–12. ISSN 0193-6484. ^ Burns, D Thorburn; Korte, EH (2013). "The Background and Implications of the "New SI" for Analytical Chemists" (PDF). Journal of the Association of Public Analysts (Online) (41 2): 28–44. Retrieved 2013-06-25. ^ Davis, Richard (October 2011). "Proposed change to the definition of the kilogram: Consequences for legal metrology" (PDF). OIML Bulletin. LII (4). ^ Johansson, Ingvar (2011). "The Mole is Not an Ordinary Measurement Unit". Accreditation and Quality Assurance. 16 (16): 467–470. doi:10.1007/s00769-011-0804-z. ^ Leonard, B.P. (2010). "Comments on recent proposals for redefining the mole and kilogram". Metrologia. 47 (3): L5–L8. Bibcode:2010Metro..47L...5L. doi:10.1088/0026-1394/47/3/L01. Retrieved 2013-09-15. ^ Pavese, Franco (2011). "Some reflections on the proposed redefinition of the unit for the amount of substance and of other SI units". Accreditation and Quality Assurance. 16 (3): 161–165. doi:10.1007/s00769-010-0700-y. ^ Mills, Ian; Cvitaš, Tomislav; Homann, Klaus; Kallay, Nikola; Kuchitsu, Kozo (1993). Quantities, Units and Symbols in Physical Chemistry International Union of Pure and Applied Chemistry; Physical Chemistry Division (2nd ed.). International Union of Pure and Applied Chemistry, Blackwell Science Ltd. ISBN 978-0-632-03583-0. ^ Leonard, Brian Phillip (May 2012). "Why the dalton should be redefined exactly in terms of the kilogram". Metrologia. 49 (4): 487–491. Bibcode:2012Metro..49..487L. doi:10.1088/0026-1394/49/4/487. ^ "Mise en pratique for the definition of the kelvin" (PDF). Sèvres, France: Consultative Committee for Thermometry (CCT), International Committee for Weights and Measures (CIPM). 2011. Retrieved 2013-06-25. ^ Consultative Committee for Thermometry (CCT) (1989). "The International Temperature Scale of 1990 (ITS-90)" (PDF). Procès-verbaux du Comité International des Poids et Mesures, 78th Meeting. Retrieved 2013-06-25.
International Bureau of Weights and Measures (BIPM) (10 August 2017). "Input data for the special CODATA-2017 adjustment". Metrologia (Updated ed.). Retrieved 2017-08-14. BIPM website on the New SI, including a FAQ page.